EDGE Boost Pro SSDs are TAA compliant, built with premium controllers, and backed by a superior five-year warranty. 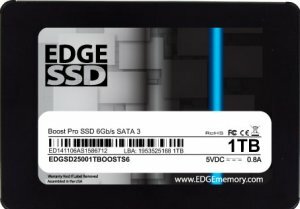 EDGE™ Boost Pro Solid State Drives (SSDs) are designed to be a direct replacement for traditional spinning disk hard drives. The result is a faster, lighter, more durable, and more reliable solution. Boost SSDs are PC,Mac, and Linux compatible. EDGE offers notebook, desktop, and server upgrade kits designed to make the transition to SSDs a smooth and easy experience. Utilizing a premium controller, the Boost Pro SSD achieves ultra fast read and write speeds. In comparison to hard drives, SSDs can improve system boot times by 5x. * Fast read/write speeds and a lofty IOPS rating provide fantastic performance gains in common tasks such as file transfers and loading software applications. A suite of security and durability features such as encryption support, T.R.I.M., S.M.A.R.T., and more, further enhance data efficiency and increase the lifespan of the drive. All Boost Pro SSDs are TAA compliant and come backed by a superior 5-year warranty. Feature-Rich - Includes a suite of security and durability features such as encryption support, T.R.I.M., S.M.A.R.T., and more, further enhancing data efficiency and increasing the lifespan of the drive. Compatible with Windows, Linux, and Mac OS X environments. This product has been discontinued and is no longer available for purchase. Please contact EDGE at (800) 259-8989 for more information or help finding your replacement part number. Thank you and we look forward to serving you.